* There is a lot of buzz surrounding this Sunday’s WWE Royal Rumble Event, but that’s not the only buzz going around, because the world of professional wrestling is about to get the jumpstart that Impact Wrestling began, NJPW & Ring of Honor brought to a new level, and now ALL ELITE WRESTLING is going to take the heights that haven’t been seen since 2001 when WWE purchased World Championship Wrestling. 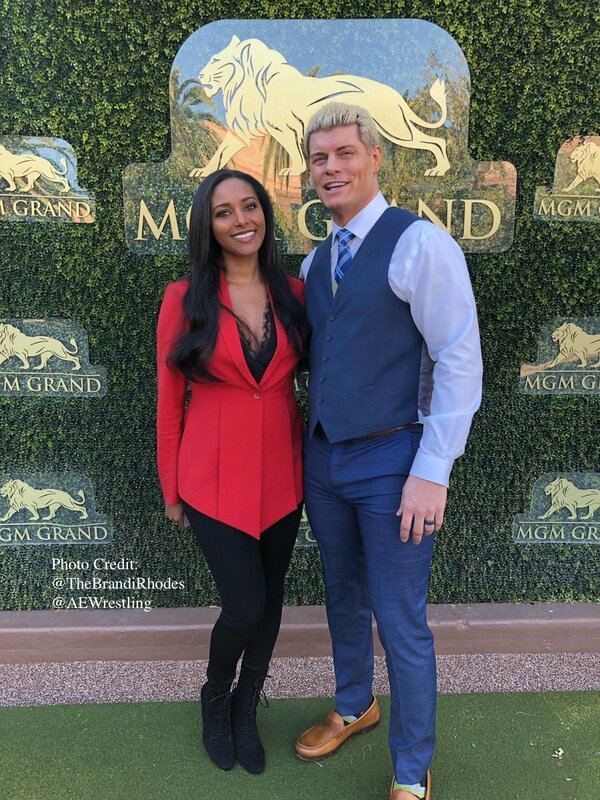 Cody aka Cody Rhodes, Nick & Matt Jackson (The Young Bucks), Brandi Rhodes, the owners of the Jacksonville Jaguars Shahid Khan & family, and a host of others are gearing up for ‘Double or Nothing’, AEW’s inaugural event that will take place in Las Vegas, NV on May 25th, 2019 at the luxurious MGM Grand Garden. * AEW already has a group of superstars that bring immediate legitimacy to the brand including Cody & The Young Bucks themselves (they also serve as the company’s Executive Vice-Presidents), Penelope Ford, Brandi Rhodes (also serving as the company’s Chief Brand Officer), Dr. Britt Baker, “Hangman” Adam Page, Scorpio Sky, and the 1st ever WWE Undisputed Champion in history Chris Jericho among others. The excitement of AEW’s arrival only grew with the company’s first press conference at TIAA Bank Field, as the upstart promotion went ‘ALL IN’ with fireworks, big time talent and event announcements, and it was even more exciting with the knowledge that WWE had a Smackdown Live event happening right across the street at Jacksonville Veterans Memorial Arena… A very smart and strategic move by AEW’s decision makers. * In this writer’s opinion, it is very intelligent for All Elite Wrestling to wait until May 25th to have its first event. We all know that Wrestlemania season in WWE is upon us and when Wrestlemania concludes and the annual NXT call-ups take place, WWE usually takes its product into a deep freeze that leaves the fans with much to be desired. This is where Cody, The Young Bucks, and the Chief “Brandi” Officer can strike. This is sure to be great for wrestling and as stated earlier, the biggest head to head competition for WWE since WCW in the late 90’s. WWE better be ready to step it’s game up, because ALL ELITE WRESTLING IS COMING, make no mistake about it!